In January 2017 Freyja, only 5yo received the devastating news that she had cancer. This cancer is so rare, it took a team of international Specialists supporting the Sydney Children’s Hospital to identify it. The diagnosis - Stage 4 Malignant gastrointestinal neuroectodermal tumor, (GNET) Clear Cell Sarcoma. It’s aggressive, it’s malignant and its location makes it inoperable. Typically, patients with this type of cancer have not lived beyond 12 months from diagnosis. As Freyja was first diagnosed with cancer in January, there may only be as little as 6 months left to save her life. 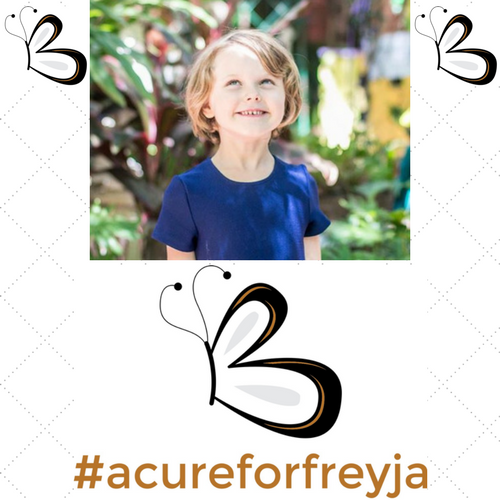 #acureforfreyja is dedicated to supporting the family and getting Freyja overseas where they have life saving treatments for rare Sarcomas' that aren't yet available in Australia until 2020. Freyja cannot wait that long.